Yet another recipe with chickpea flour. I am crazy about this stuff. 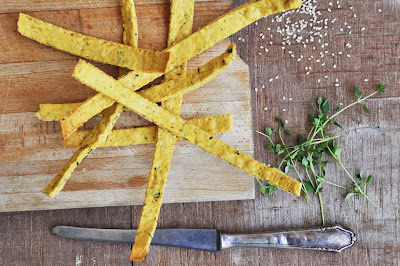 I posted a similar chickpea cracker recipe before, but this one deserves an extra post. Do you know hummus? Its main ingredients are chickpeas and sesame paste. I don't know why it didn't strike me earlier to combine these ingredients in the cracker too. So here we are: chickpea crackers with sesame seeds. Lots of sesame seeds. Black and white ones. The crackers go beautifully with the hummus. We eat both by the kilo these days. A light, vegan and gluten -free snack, yet filling. Bon appetit. In a large bowl, sift together chickpea flour, salt, sesame seeds and thyme. Stir in oil, then ad the water. Knead until it becomes a supple dough. Add little more flour if too wet, or little more water if too dry. Form dough into a disc. Bake for 15-18 minutes or until edges turn golden brown. Remove from the oven and let cool. Break crackers at pre-cut edges. Serve immediately or keep in open bowl (they tend to un-crisp in airtight containers).